Personal Totem of Mohegan Chief Tantaquidgeon, commemorated on a plaque at Norwich, Connecticut. ↑ Betsy Malloy (2014). 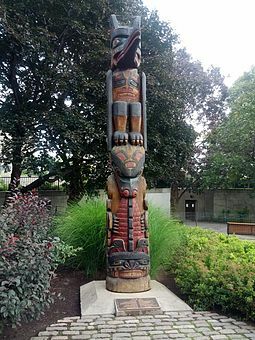 "Totem Poles: A Brief History of Totem Poles". About.com: California Travel website. Retrieved 29 March 2014. ↑ Frazer, J.G. (1910) Totemism and Exogamy (4 vols) London: Macmillan. ↑ Levi Strauss, C. (1962) (1969) Totemism, Harmondsworth: Penguin. ↑ Barfield, Thomas (ed) (1997) The Dictionary of Anthropology, Blackwell. ↑ Bernard, Alan and Spencer, Jonathan (eds) (1996) Encyclopedia of Social and Cultural Anthropology, Routledge.